Guess what? Today is the start of FABULOUS FREE FRIDAYS IN FEBRUARY! You heard me right, every Friday this month stop by leave a comment and win some rad freebies. Oh man do I have some good stuff coming up. Let’s kick things off with a gift you can’t put a price on – occupied and quiet kids. For my 11 month old, who only has 1.5 toofuses these yummy little airy organic finger foods keep him endlessly entertained in his highchair. Baxter loves to practice picking things up off his tray and feeding himself. I have checked many an email at the kitchen table or finished up countless craft projects while Baxt sat content in his chair munching puffs. My favorite part about puffs is that they disolve really easily. Since we are lacking in the tooth department hard cereal still scares me a little bit. But wait there is more… HappyPuffs also entertain my toddler. With a few staples from the pantry a full 20 minutes of free craft time could be yours while your kids entertain themselves with puffs. Put a glob of Playdoh on a plate. I have a recipe to make your own. Stick a spaghetti noodle in the center of that Playdoh sticking straight up. Next, give your toddler some puffs to thread onto the noodle. Did I mention these puffs can also make your kids smarter, this is improving hand eye coordination here people. 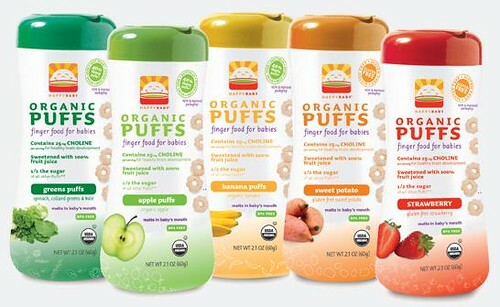 As if I didn’t love these puffs enough, did I mention the plastic containers they come in are BPA and PVC free? When we are all done with a batch of puffs I throw the empty container in the tub for my kids to play with. Why do kids think bath water is so delicious? Um gross, but I digress. Anyway, I use the containers to rinse the shampoo out of Tallulah and Baxter’s hair. Double whammy! Ok so ya, the Happy Baby people gave me free stuff and I agreed to say nice things about them – but this is all true. My kids ate their puffs and food pouches long before this post. If you were to come to my house and peek in the tub you would really see empty puff containers co-mingling with boats and squirter toys. The best part is they want to give you some free puffs and pouches too! All you have to do is leave me a comment and I’ll choose a winner next Friday! Posted February 3, 2012 & filed under contests, Kids. You're right, happily occupied kids is the best gift of all, LOL! Thanks for the fun giveaway! I have 3 little boys, I can use all the help I can get. My nephew lives for these puffs! I'm expecting my first baby after 8years of fertility treatments. So learning these tips and tricks is EXACTLY what I need!